8 #lit legal Instagram profiles for your scrolling pleasure! We love Instagram! It's crazy the amount of raised eyebrows I get when I tell people how powerful instagram is in our business and what an opportunity it is for theirs. It makes sense though. If you're BD hasn't progressed to circa 2006 and you aren't even writing great blog content, engaging with people on instagram will seem incredibly different. So why do we love it? Because it is flexible, it let's you tell your personal and your brands story, and it let's you engage with people who are decision makers directly without all the fluff of Facebook or utter repetitive boringness (is that a word?!) of LinkedIn. 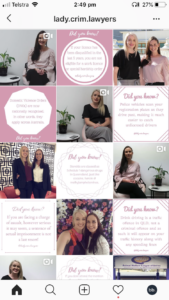 But that's all words and the magic of Instagram is visual, so what better way to demonstrate that magic than by sharing our 10 #lit law profiles. There are lots of great one's out there (like we highlighted here) but we wanted to share some more to get everyone thinking about the possibilities for their profile. Are they trying to always flog stuff? No. Are they always telling you what they know? No. Are they sharing “too much” personally.. not really! They are all true to their brands, give their target audience value, and leave them with an impression of what the business is about. Insta is not about SELL SELL SELL. It is about nailing your brand story and helping you communicate with your target audience in a personal, creative way. If you don't know Clarissa from The Happy Lawyer / Happy Life podcast where have you been hiding? A pioneer of helping lawyers live better lives Clarissa lives and breathes the power of social media. Her feed is an always uplifting insight into her business, family and travels which is a must follow. Ohhhh sooooo pretty. I mean look at it. Flow Legal absolutely NAIL the aesthetic while creating valuable insight... it's so nice I just want to stare at it all day. With an amazingly vibrant and always unique feed we love Kit Legal's BRIGHT and engaging page. The are certainly not afraid of colour, but why would you be when you're running a unique and incredibly successful practice around Australia. Tara falls squarely in the “awesome legal personality” category and we always love her videos and the overall “vibe” of her posts. She creates some very valuable content for her prospective clients and those that refer her work while documenting her personal journey. The Law Squared team appear for be everywhere.. and good thing they are because what a great team they have. As one of the nations most successful and fast growing firms they have a great story to tell and do an amazing job. A page about a book? How is that legal? Well, Catherine is a lawyer as well as being the author of the amazing “Let's Make it Work Baby”. The page is a great example of creating a focus around what you do and picking out something you want to be known for. Oh and she also recently appeared on our podcast! Whatever you are doing keep doing it! This is a great example of a consistent brand. They are taking a simple yet powerful approach to their Insta... it's not sales based, it's brand and values based. and it is clear they stand for consistency and quality. Sometimes less is more and is right on the money. A new addition to our Insta feed but we wanted to give them a shout out for the consistency and the great videos! Useful content that shows their personality ad gives their target audience value. They come across as approachable, professional and as real humans you can relate to. Do you run your own legal services business? Are you getting results from your social media strategy? If not, we should talk. We are experts in helping firms of 1-10 partners grow their profile, attract more work, and future proof their business. We even have a special strategy & insight package just for small firm leaders to help you get started.